But these brownies really are the best ever. At least the best I’VE had. And c’mon folks, I’m 48 years old… that’s a lot of brownie eating years to cover. I’ve had boxed prepackaged brownies, Little Debbie brownies (to which I admit having a soft spot for even though I am fairly sure that there is not even ONE real food in them), mix brownies, so called gourmet brownies, burned to a crisp brownies (don’t ask… it wasn’t pretty.) brownies made with chopped chocolate, brownies made with cocoa, blondies, brownies red headed step child and so on and so forth. I’ve eaten a lot of brownies. Another wonderful thing about this recipe? You don’t need a bowl. This all gets mixed right in the saucepan. Can’t beat that… amazing taste AND easy. Position oven rack in the bottom third of oven and preheat to 325 degrees. Lightly butter an 8×8 square baking pan and then line with parchment paper. Lightly butter the paper or spray with cooking spray. Melt the butter in a medium saucepan over medium heat. Cook until the butter isn’t foaming anymore and there are browned bits on the bottom of the pan. Stir often and keep an eye on this. It can go from lovely browned butter to a smelly burned mess in no time flat. This will probably take about 5 minutes or so. Remove from the heat and immediately add in the cocoa, sugar, water, vanilla and salt. Stir well. Let cool five minutes. Add the cold eggs to the hot mixture, one at a time, beating well (by hand) after each addition. When the mixture is thick and glossy, add in the flour. Beat for 60 strokes. I won’t tell anyone however if you do it 61 or even 59. It’s ok. We’re a flexible crowd. Stir in nuts if using. Spread batter into the prepared pan. This would be the time to swirl in jam if you wanted to do that. Bake at 325 for about 25 minutes or until a skewer inserted in the center comes out almost, but not quite, clean. Cool the pan on a rack then lift out by the edges of the paper. Cut into 16 squares. Or just leave it in the pan, ladle whipped cream on top, get a spoon and get gloriously ill. Your choice. 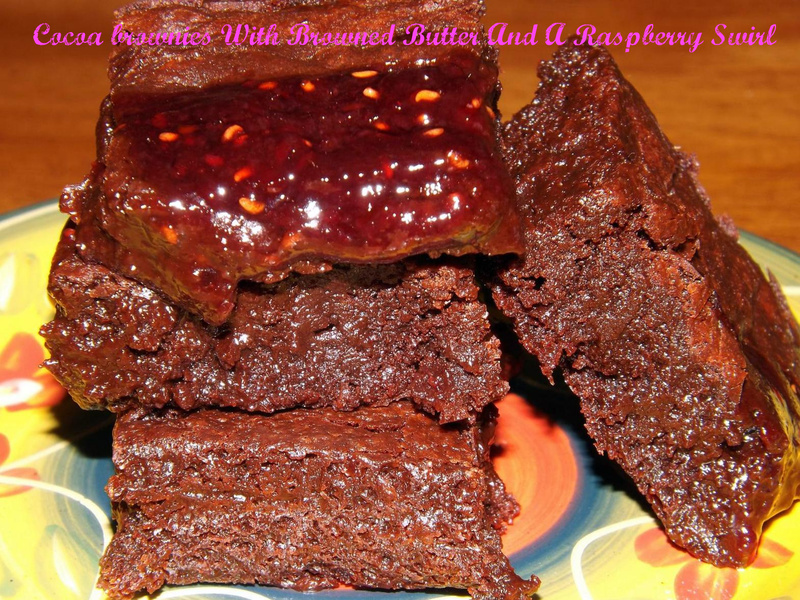 This entry was posted in Brownies, chocolate, Christmas, cookie bars, Desserts, Easy, Holiday Foods and tagged brownies, chocolate, Christmas, dessert, easy, holidays by Janet. Bookmark the permalink. How much jam did you use? Just found it, never mind! Janet – This sound like they are the best ever! I am pinning this for the next time I need a chocolate fix! BROWNED BUTTER MAKES EVERYTHING BETTER! Oooh these look so intense and fudgy! Brown Butter + Brownies?! I can totally see why these would be amazing!